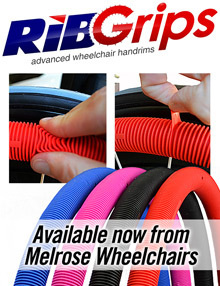 email phil@melrosewheelchairs.com and we will get it for you. Phone us 866 764 5526 to check on stock availability if the product is required immediately. The Joe Jackson Foundation is a non-profit organization dedicated to improving the quality of life of children with Spinal Cord Injury (SCI) and their families and to provide adaptive equipment throughout United States. 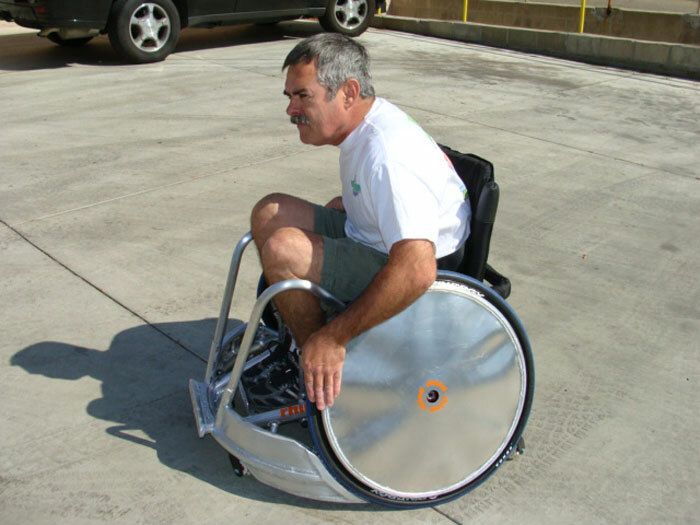 This organization was created by Joeï¿½s calling to help inspire individuals disabled by SCI to continue living actively and to overcome the challenges they face. The Challenged Athletes Foundation "CAF" offer all disabled athletes the chance to apply for assistance for "equipment" costs. If you have a physical disability that would qualify you to compete in any Paralympic sport then youï¿½re eligible for a grant from CAF. 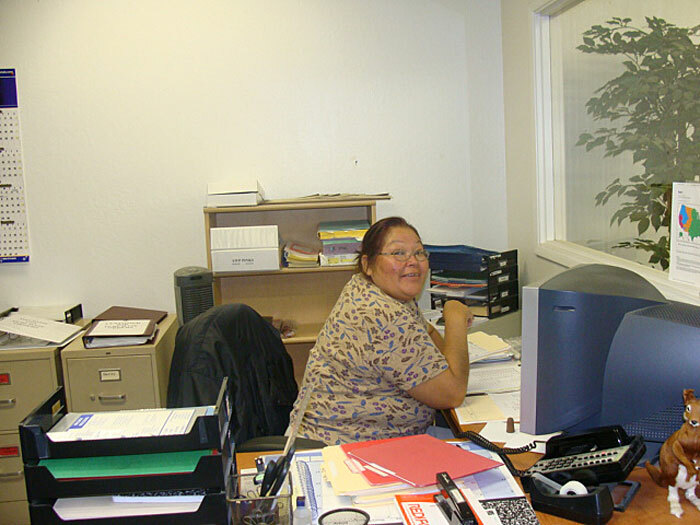 You may apply from outside the United States and you do not have to be a US citizen. We will have these in stock now. They are ribbed hand rims made from silicon rubber - the same stuff oven gloves and trays are made from these days - and they are attached to an aluminium ring that have both riv-nut or tabbed attachments. Available in four different colours they only come in 24" / 25" at the moment but they are looking to expand their range of sizes. We have trialed these and they feel soft, grippy and robust. Using a larger diameter tube for your handrims can help reduce repetitive strain injuries associated with tight gripping of your fingers. The larger diameter opens up the fingers for a much more comfortable push. 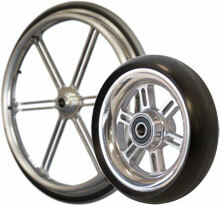 We can make 1" diameter handrims for most wheel sizes with tabs or rivets to suit your wheels. They come as hard anodized, vinyl coated, foam coated or rubber coated. 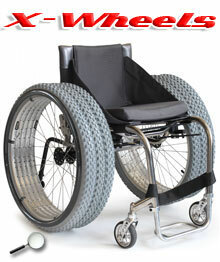 Thats right, we stuck a couple of wheels together and called them X-Wheels. But man do they work, they run real smooth, can handle almost any surface and are as light as they look. 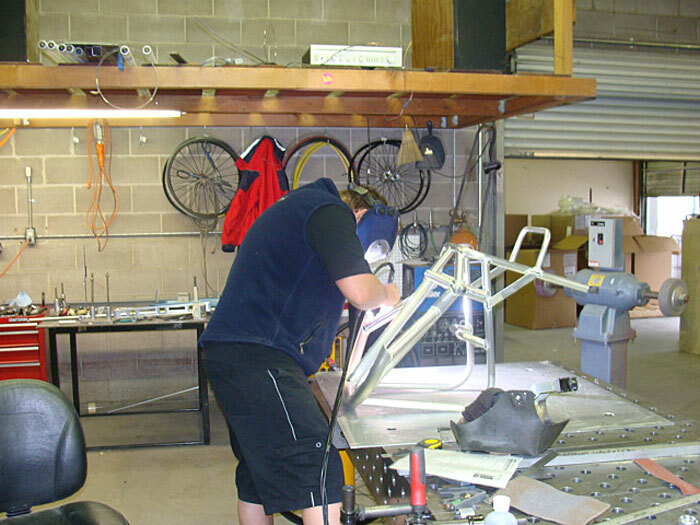 They have a standard offset and hub so should fit most day chairs without any modifications, you might have to adjust your brakes if using the mountain bike tyres - but thats it. For super fantastic offroad ability use them with your FreeWheel. Get where you want to go independently! 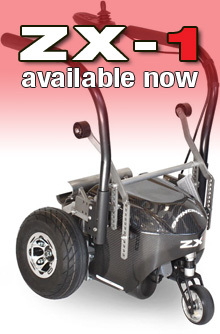 The incredible ZX-1, in stock now! 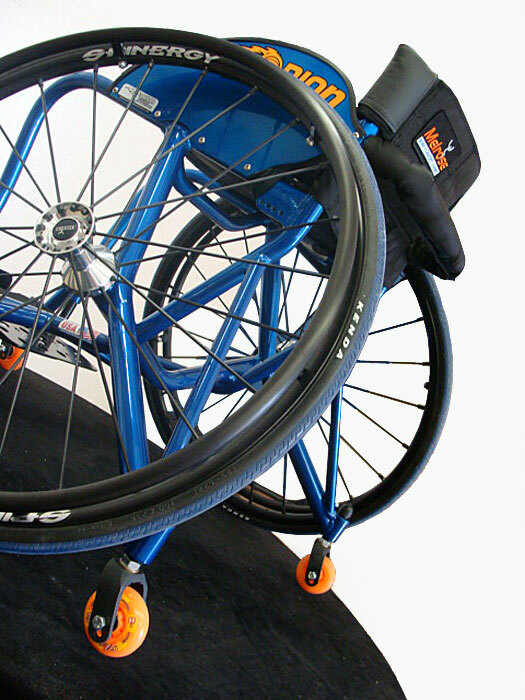 The ZX1 is a revolutionary new power add-on unit that converts a manual day chair into the coolest powerchair on the planet. 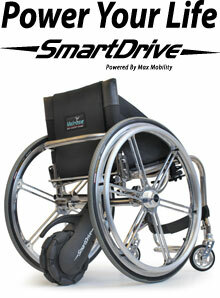 The SmartDrive is a revolutionary new power assist device that gives greater freedom and power to chair users. To go - just push as per normal, the unit remembers your speed and maintains it until you brake as per normal to stop. 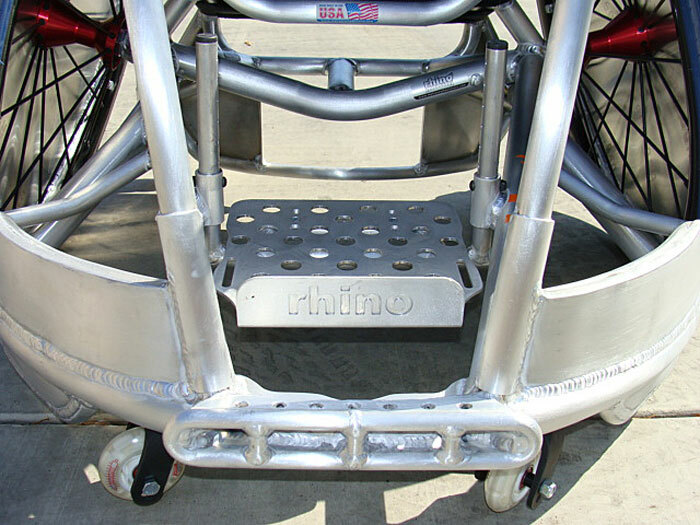 It rotates freely on the camber bar so can accommodate wheelies and curbs with ease. Although its range is 10 miles and it can whisk you along at over 4.5 mph, its greatest trick is its portability. 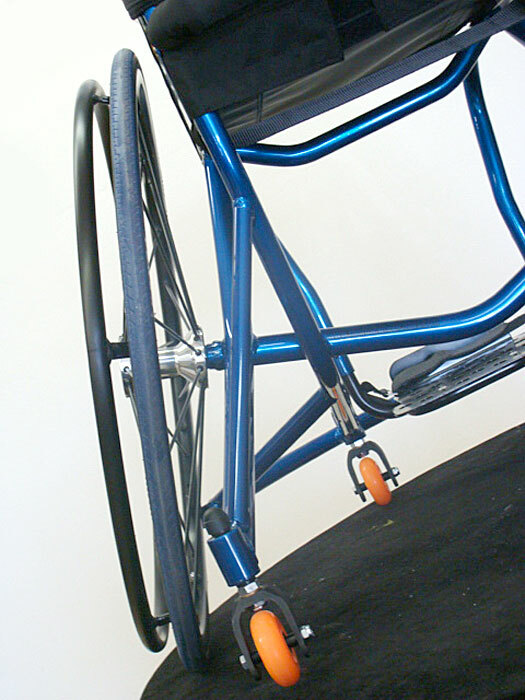 The SmartDrive unit hooks onto a pin attachment that is fixed to your camber bar - the battery slides under the seat, hooking over the sling with one connecting wire plugging into the drive unit. Its that easy and you are ready to go. 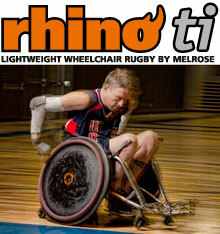 Our Rugby Sports Chair the Rhino can be built in Titanium, the lighter frame aids endurance over a weekend tournament and reduces the effects of shoulder strain. We have several top sports people using our Titanium range of Sports and Day Chairs and experience has taught us that a lighter chair is a better chair. 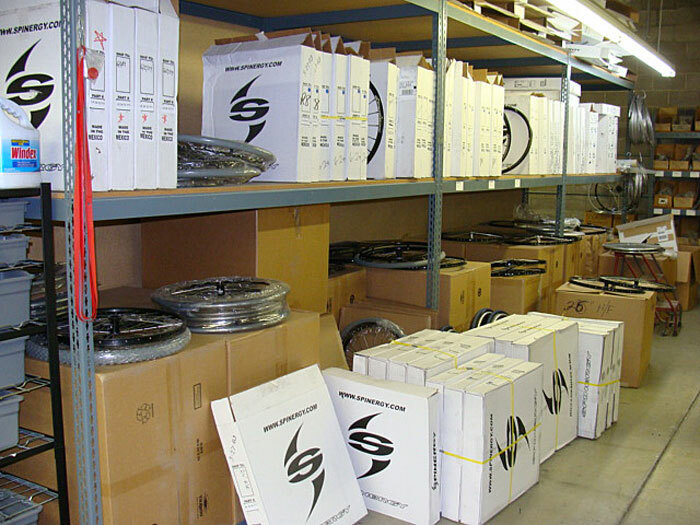 We have the largest range of everyday, sports and racing handrims in North America, contact our friendly staff to order yours now. left to right: Hard Anodised, Vinyl Coated, Foam Coated, Projection Vinyl Coated, Rubber Coated Round Profile, Rubber Coated Rectangle Profile. 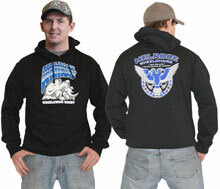 Yah, we finally have in stock these fantastic quality polycotton hoodies, just in time to fill your Christmas stockings. Screen-printed with a Melrose Rhino (rugby sports chair) logo in blue and white on the front and a Melrose New Zealand / USA (two headed bird) logo in blue and white on the back, these are available in any colour (as long as its black). A wide elastic waistband keeps the draught out while a unipocket is good to keep the hands warm. Sizes available from S to 2XL. Available freight free within mainland USA. Contact us for delivery to other countries. 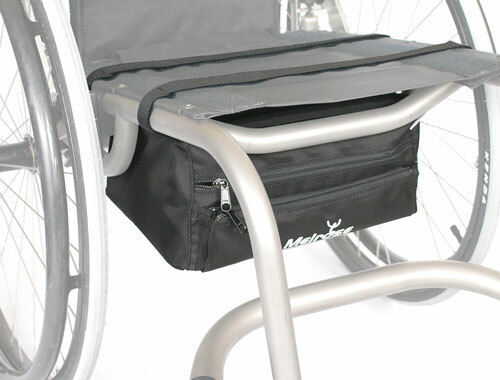 Produced by Sunrise Medical the Jay range of Wheelchair Cushions and Backs are industry leading seating products that offer full positioning and skin care solutions for wheelchair users. 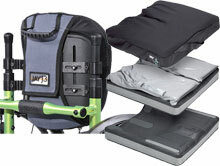 From pediatric to bariatric users the foam, fluid and air padding options provide maximum comfort. 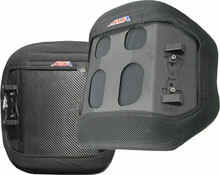 They are complimented with a range of incontinent resistant, low shear and air ventilation covers. ADI's full line of stylish and lightweight back supports are designed and fabricated with the user in mind, offering many options to maximize user potential, while providing a single source for clinicians and dealers. Ergonomically designed, the aluminum and Carbon series backs promotes an upright posture, easing the strain on the lower back, by providing support at the posterior pelvis and trunk. The backs come in a range of widths and heights, light weight quality material is used and the range comes with a host of accessories. Tired of using the same old castors as everybody else?. 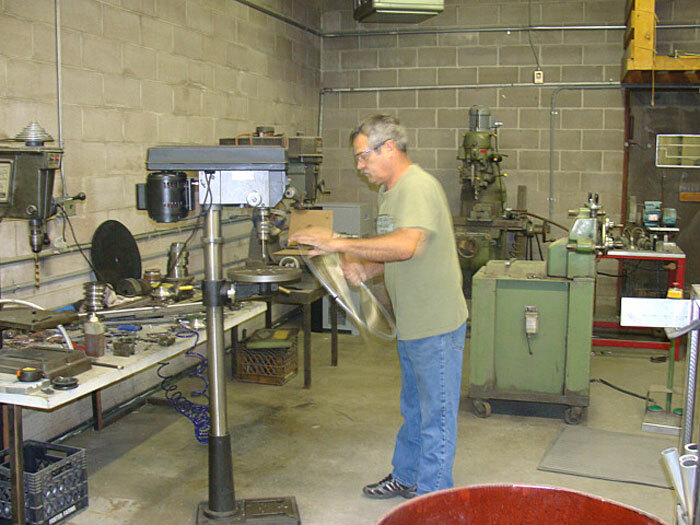 We make all our own alloy castors and have recently been milling some different designs. Shown here is a castor to match the "Glance Classic" rear wheel, but our CNC operators can also create a one off pattern for you. This one has a polished aluminium finish but we can also anodize them in a range of colours. Stand out from the crowd with your very own designed, unique castors. Talk to Philip about ordering a pair for you and your chair. Getting puntures? try some heavy duty tubes from Kenda. These come in both 24" and 25" and have a wall thickness of 2.25mm, they were developed to prevent pinch flats. Use them with our Schwalbe tires to double your protection and stay puncture free. Check out our USA wheelbag designs, or design your own for a completely unique look. Send us a photo and let us put it on your wheelbag for a personal statement - stand out from the crowd! 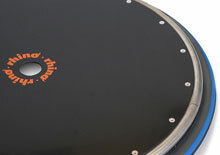 We have recently seen an increased demand for oversize handrims for our Alloy/Poly spokeguard combination. These sit flush with the wheel rim protecting the wheel rim from being damaged during a game, a damaged wheel rim can cause puntures and over time contribute towards a wheel failure. 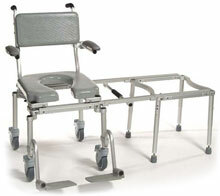 Melrose is proud to announce that it is now an agent for the Nuprodx range of Medical Equipment. 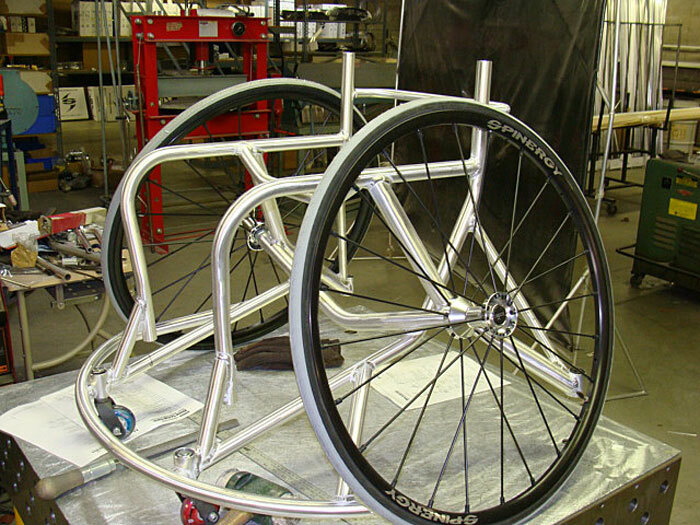 Nuprodx designs and manufactures high quality durable medical equipment for people with disabilities. 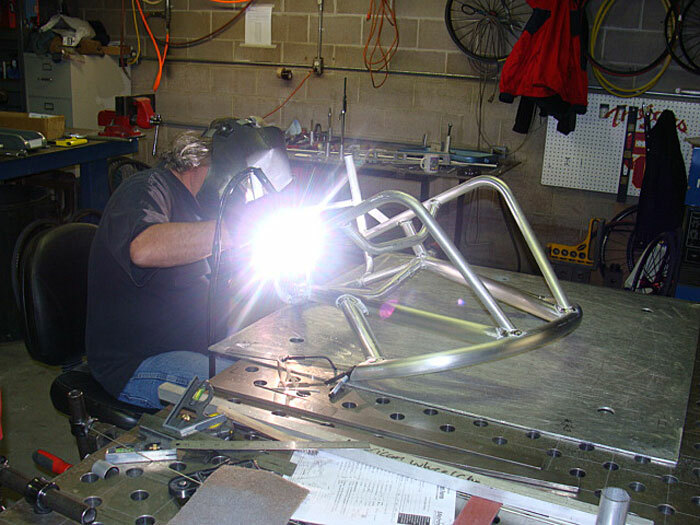 They have complete manufacturing capabilities in northern California, including computerized machining, welding, and fabricating. Their focus is on bathroom equipment, such as bath benches, shower chairs, and raised toilet seats that are strong and stable for everyday home use and lightweight and portable for travel. 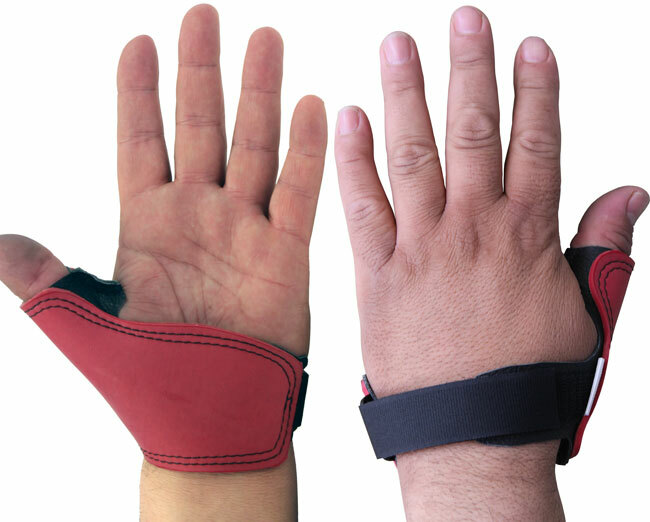 These handrims are designed to take the hard knocks. The 12 tabs connecting to the wheel rim provides a much more rigid setup and any hard hits are more evenly distributed onto the wheel giving your wheel longer life protection. Projection hand rims to suit your light weight Spinergy wheels. 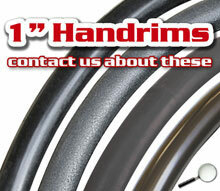 The NEW design hand rims are mounted in the standard 6 hole position on the rims. We are able to build from 6 to 14 obiliqe or vertical projections. Fine tune your Frog Legs with different grade polymers to match your weight for the perfect ride. We have made up some complete wheels with tires, hand rims and bearings and we are offering these at SPECIAL LOW PRICES while stocks last. 2 Offensive and 2 Defensive Rhino Rugby Sports Chairs, 1 Lacrosse Sports Chair and 1 Orion Basketball Sports Chair. 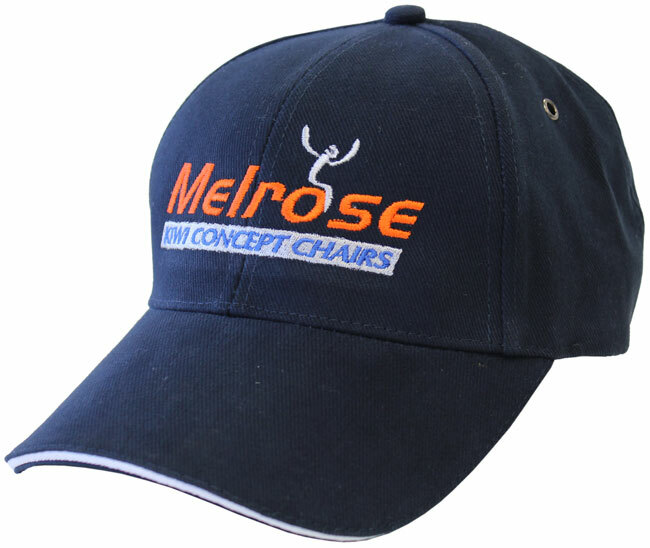 Phone 866 764 5526 or email phil@melrosewheelchairs.com to get the details of these super cheap, top of the line sports chairs. 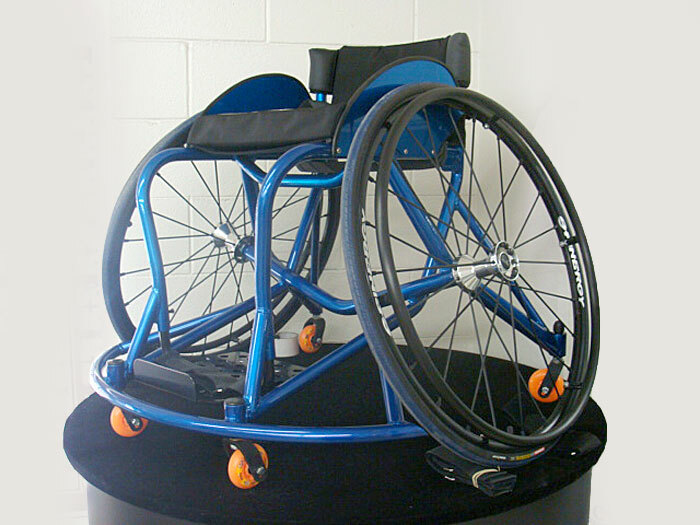 If you play wheelchair rugby or basketball you will know how important it is to transfer as much energy as possible from your body to the wheels, and not wasting energy sliding around on your cushion. Melrose Ratchet Bindings hold you securely in place so all your effort is directed to where you want, and thats into your wheels and away from your opponents. 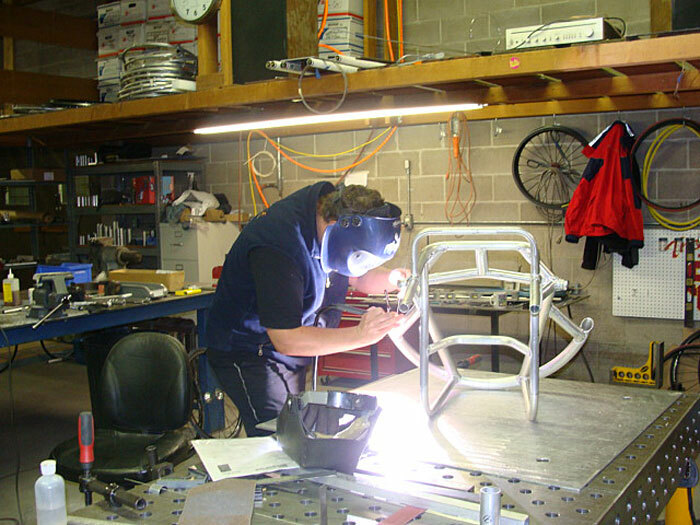 Melrose have spent months developing Hybrid Ceramic bearings with an American bearing designer for our sports chairs. These bearings are made up of metal rings and silicon nitride ceramic balls. Compared to steel balls, ceramic balls are lighter, smoother, harder and corrosion resistant. 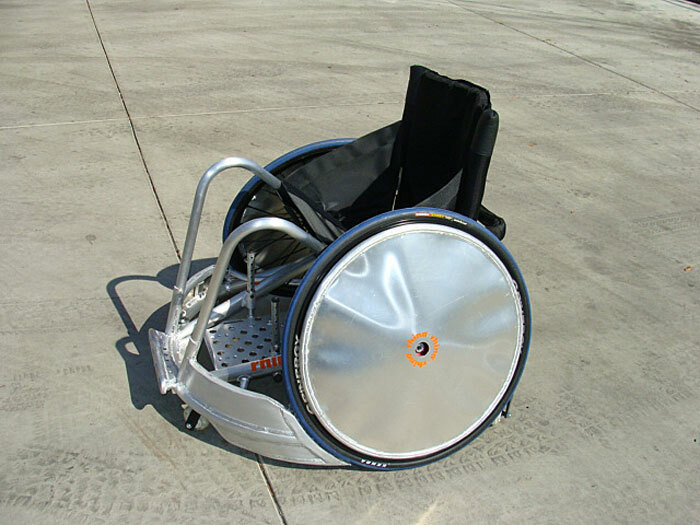 The Dino is an ultra light weight, high performance wheel, with the strength for everyday use. Designed for maximum performance, the Dino utilizes Round Bettys proprietary aluminum tubular spokes. The responsiveness of the Dino will improve your pushing dramatically, allowing you to roll faster and longer than any other wheel on the market.